What does that mean? We have by no means turned a corner, but at least the bleeding stopped for October. The 271k total is very respectable, and the private sector number is 268k. There were net +16k revisions to August and September for the private sector totals which, while better than a down revision, comes nowhere near making the numbers acceptable. For comparison, including today’s data, the average add for the private sector for all of 2015 YTD is 207k while the average for the last 3 months is 181k. The Not in Labor Force tally fell by 97k in an unusual and refreshing pause in the explosion but still leaving the number of truly unemployed Americans at 94.5M. The Civilian Labor Force grew by 313k interrupting a three month slide, which is a plus but still doesn’t get us anywhere near the 2015 high, which was reached in May but substantially better than October of 2014. The work week for the private sector remains flat at 34.5 hours for October, which is the average for 2015 YTD. The big winner however is Construction, which saw a sizable jump in both hours and pay in October, which is consistent with other measures released during the month. The Diffusion Indexes for the total private sector and manufacturing both saw significant improvements this month, especially manufacturing which eked out an expansionary 51.9 (50 is break-even) after spending the prior two months deep in contraction below 40. So, why were the dismal Participation Rate and seemingly great Unemployment Rate essentially unchanged? If you read us regularly you know the answer… The Civilian Labor Force grew by 313k, and the net number of new hires was 271k. That narrow delta just won’t move the needle that much. 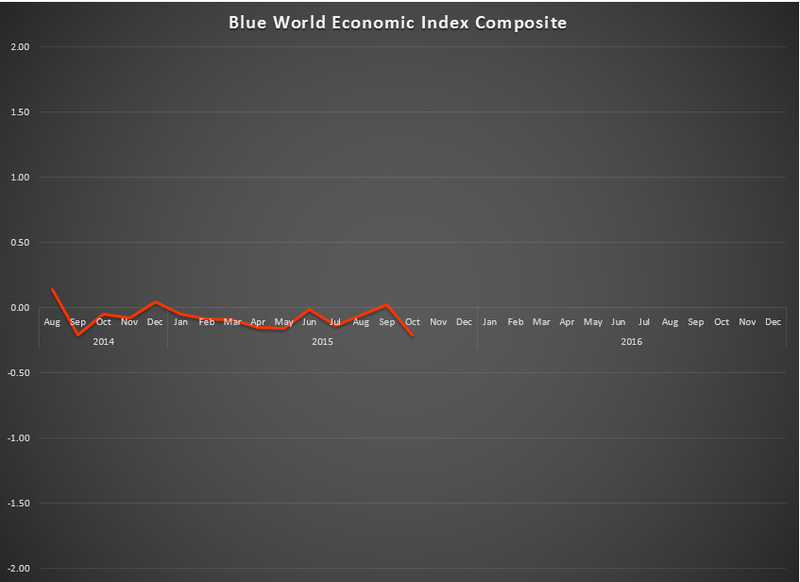 FYI – later today we will post out first podcast of the Blue World Jobs Report Analysis. A link will be sent when it’s up. 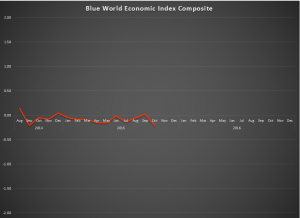 The Blue World Economic Index™ came in lower for October 2015 at -.21, down from .02 in September. Some trend downgrades and new report coverage (TD Ameritrade IMX) contributed to the downward move. In an unusual event, all 8 of the major categories declined since last month. The most surprising were Real Estate and Services. Real Estate, while still positive fell from .43 to .19 and Services fell from .45 to barely positive at .01. These two had been among the better performing categories over the last year.